We're saying "bye" to layers and "hello" to these spring #ootds. From the AOL Partner Studio. It's finally time to store away those heavy knitted sweaters and step into spring! We're saying "bye" to layers and saying "hello" to open-toe shoes (how we've missed you, old friend). But this year, we're elevating our spring style with stunning jewelry that you can mix and match to suit your aesthetic. 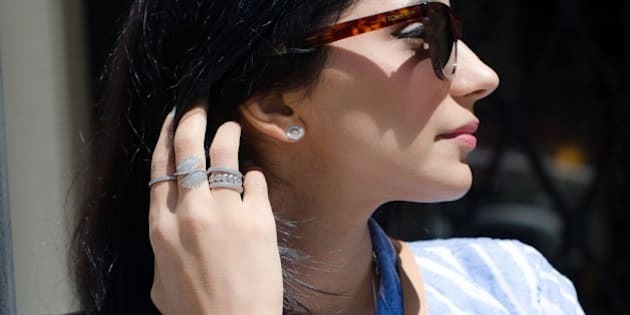 In collaboration with PANDORA's line of stackable rings and cute earring studs, our HuffPost Style contributor, Smitten Sophie, takes us into her closet and shows us three spring #OOTDs that totally slay. From the beaches in the Hamptons to the office boardroom, our style expert teaches us how jewelry can amplify any look for any occasion. Smitten Sophie is totally giving us Gigi Hadid in Vogue vibes (still dead) with this outfit. She looks effortlessly chic and stacked to perfection with her PANDORA Jewelry. We love the way she mixes and matches their rings to express her unique style. What would you wear on a leisurely weekend in the Hamptons? Take some cues from our HuffPost Style contributor who looks like a breezy bombshell in this pinstripe top. BTW, we need her earrings. Dying.